© 2016 Stephen Mottram. All rights reserved. 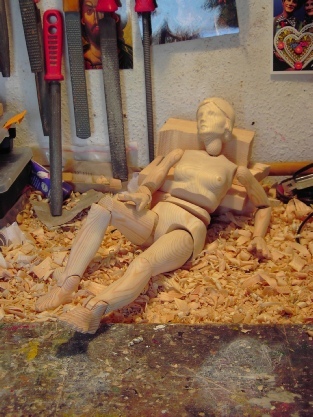 Stephen Mottram studied International Relations and Russian at Surrey University in England, and then Swedish, Photography and Woodcarving at Nordens Folkhögskola at BiskopsArnö in Sweden. There he developed an interest in puppet theatre and made his first marionettes. In 1980, Stephen went to work for Eric Bramall and Chris Somerville at the Harlequin Puppet Theatre at Colwyn Bay in Wales. Then he was given a job by Ray DaSilva at the newly opened Norwich Puppet Theatre. For two years he toured with their large scale marionette productions of Pinocchio and Hansel and Gretel. In 1982, Stephen received a one year bursary from the Arts Council which he used to train in mime and movement, first with Desmond Jones in London and later joining the student puppeteers at the Hungarian State Puppet Theatre in Budapest. Stephen on the set of ‘Alice’ in 1983. 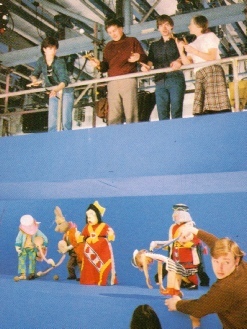 On his return to the UK, Stephen was asked to direct the puppetry for the Anglia TV film of Alice in Wonderland, first shown on the ITV network in 1984. After ‘Alice’ Stephen lived in France for two years and together with the French Puppeteer Marie-Christine Hue made two touring shows. One, “La Malle”, was for schoolchildren. And the other, aimed at adults was “Marionnetudes”. 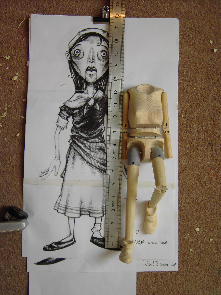 Marionnetudes consisted of several 15 – 20 minute pieces – slightly longer and more complete than the usual short sketches common to marionette shows at the time. They were performed with Stephen and Marie-Christine manipulating marionettes in full view of the audiences, on a small, black-carpeted touring stage. During this period, Stephen started to be fascinated by the developing field of electro acoustic music. After meeting the composer Simon Waters, now the director of the electro acoustic music studio at the University of East Anglia, he started experimenting with the relationship between especially composed electro acoustic music and carefully manipulated marionettes. “In Suspension” in 1990 was a distillation of Animata for adult audiences with music by Waters, Glyn Perrin and Pete McPhail. The show had no words in it, just “marionettes doing interesting things and a dynamic music which held the attention of the audience.” It soon became popular with overseas promoters and Stephen started touring internationally. 1991 brought him a British Council tour of Brazil and after that he travelled frequently with the show under the British Council banner, particularly in South America and in South East Asia. 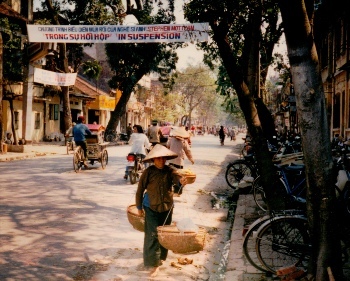 Stephen to produce a new piece for the festival in 1995. He was to work with the composer Glyn Perrin again, and their two year collaboration produced “The Seed Carriers”. The Seed Carriers is a nightmarish glimpse into a horrifying world where people behave like insects. New people are farmed, using the seeds gathered from the dried bodies of others. The performance evokes questions about the value of the person, and about the vulnerability of the individual in a genocidal culture. The 55 minute piece uses marionettes and automata and has a powerful continuous electro acoustic score. The stage design, by Jessica Shaw is based on the paintings of Heironymous Bosch. The show was directed by Melanie Thompson. Stephen’s next piece, “Organillo” grew from a collaboration with the Argentinian Composer, Sebastian Castagna. 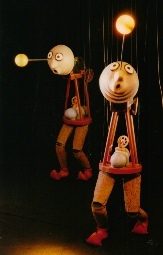 Between 1998 and 2000, the puppets, movement and musical sequences were created simultaneously. The electro acoustic score is based on multiple recordings of a miniature street organ which Stephen built in his workshop in Oxford for the project. The basic concept of the work is that the reproductive processes of primary evolution are re-run during the fertilisation and development of a human baby; that the womb is like a dark, salty primordial sea. Unhappy about the ambiguity of Organillo, Stephen redesigned the staging in 2004 and added significant new material to the original show. Additions were also made to the music which was completely remixed. The title was changed to “The Seas of Organillo”. At present, in addition to performing his own work, (which has now been seen in more than 40 countries) Stephen teaches courses in movement and manipulation in a number of European colleges and theatre schools. He is a visiting lecturer at The Institut International de la Marionnette in Charleville Mézières, France and a contributor to courses at the Central School of Speech and Drama and E15 School of Acting in the UK. He is a regular teacher at MAAF Academy in Pinerolo, Italy. Stephen’s main interest is the perception of movement and how evolutionary elements underpin our ability to communicate clearly using movement as a theatrical tool. His current series of workshops is called “The Logic of Movement”. He has written articles about performance issues in puppet theatre for a number of theatre journals including “Lalek”, “Puck”, “Fantoche” and “Animations”. Most recently, Stephen has been experimenting with minimal puppet elements which exist exclusively as a series of gestures which can be interpreted by an audience as the movements of a human figure. The puppet as an object no longer exists – only what it does can identify it as a theatrical character. 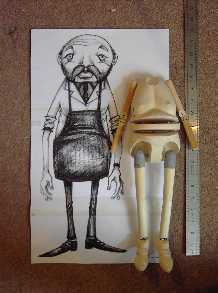 Simultaneously, at the other end of the puppet spectrum, Stephen is researching new ways of operating and building string puppets – giving workshops and seminars on the design, construction and performance of marionettes. Stephen lives with his wife and two children in Oxford, UK. Marionette by Stephen for Rosetta Life. He returned to the UK to work on the giant plant ‘Audrey 2’ in the Warner Bros film “The Little Shop of Horrors” which was shot at Pinewood in 1986. Then, in 1987, Stephen helped make the puppets for, and perform Channel 4’s “Tales from the Decameron” – a film of shadow puppets, shot in real time, performing Boccaccio’s stories as written by Roger Waddis. This was one of Channel 4’s first daring steps into broadcasting animated films. From 1986 onwards, Stephen continued to devise short, self contained pieces, mostly based on movement and musical ideas and built a body of work which he called “Animata”. This repertoire toured all over Britain between 1986 and 1991 under several different titles, mostly in schools and children’s theatres. During 2003, Stephen worked for Niels Bald in Copenhagen, performing marionettes for the Danish feature film “Strings” in which all the characters were string puppets. The film, directed by Anders Rönnow Klarlund took the marionette to its limits, placing scenes in snowstorms, underwater, in deserts, torrential rain and burning forests – all filmed in real time. In 2007 Stephen collaborated on a live action marionette film at the National Film and Television School at Beaconsfield. The Japanese director, Masako Tomiya made the shocking content of “The Butcher” more poignant by using the ‘innocent’ medium of string puppets to tell the story.